At a conference in Brussels organised by the European Commission, the EIT has announced plans to re-launch the competition for a new innovation community, EIT Manufacturing, at the same time as for EIT Urban Mobility in 2018. The indicative timeline for the EIT’s 2018 competition for the new Innovation Communities in the areas of urban mobility and added value manufacturing has also been published. The European Institute of Innovation and Technology (EIT) is a unique EU body that powers innovation and entrepreneurship across Europe to overcome some of its greatest challenges in the areas of climate (EIT Climate‐KIC), digitisation (EIT Digital), energy (EIT InnoEnergy), food (EIT Food) health (EIT Health) and raw materials (EIT Raw Materials). As an integral part of the EU’s Horizon 2020 framework programme for research and innovation, the EIT Community – Europe’s largest innovation network – brings together leading business, universities and research labs to form dynamic cross‐border partnerships – Innovation Communities – that develop innovative products and services, start new companies, and train a new generation of entrepreneurs. In November 2016, the EIT Governing Board decided not to designate a Knowledge and Innovation Community (KIC) in added value manufacturing since the proposal received did not meet the expected excellence criteria. 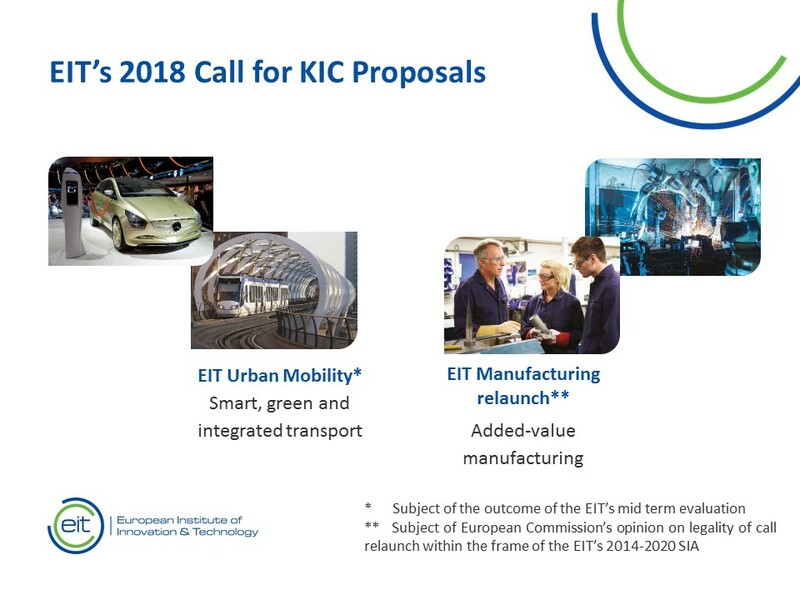 The launch of the EIT’s 2018 competition (Call for KICs) in Urban Mobility depends on the outcome of the EIT Evaluation being conducted by the European Commission. The decision on whether to relaunch the call in added-value manufacturing is subject to the European Commission’s opinion on the legality of relaunching the call within the frame of the EIT’s Strategic Innovation Agenda 2014-2020. The European Commission’s opinion should be announced within the next few weeks and will be published on the EIT’s website. Catch up with the latest news from the EIT Community in the Newsroom. Subscribe to the EIT Newsletter to get the best of the EIT Community's news in your inbox once each month. Do you use social media? Follow us and get updates in your news feed. Main Photo: Competition for new Innovation Communities: EIT Manufacturing and EIT Urban mobility announced!